Stay up to date with news about MotionPark. Next year, in 2019 it is 350 years ago that the famous painter Rembrandt van Rijn died in Amsterdam. An extraordinary year full of exhibitions and special events celebrating the work of one of the world’s greatest artists. 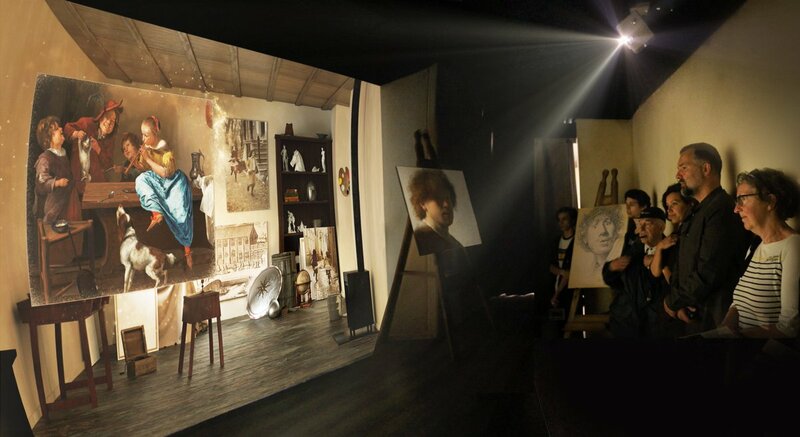 One place that you definitely have to visit is the Young Rembrandt Experience we created last year. You will find this experience in the Leiden city center. If you think about Rembrandt, the city of Amsterdam is mostly the second thing the pops in your mind. Few people know the that Rembrandt actually was born in Leiden. He grew up there and met people that played a big roll in his later life. In this video mapping experience, you will learn about Rembrandt's first teacher. Jacob van Swanenburg. Jacob learned Rembrandt his famous painting techniques. Recently MotionPark started to work on the audio and video production of a new attraction in the center of Leiden. This experience will tell a story about a young and not yet famous artist who was born in this city; Rembrandt van Rijn. The story takes place in a tiny old house and the visitors will step into a different world, four centuries ago. Coming months you will find here more information about the project. MotionPark works in close cooperation with Jora Vision on this new experience. Madurodam has big future plans which will carry on until 2030. Through different stages, they want to expand by making the park more green, add a lot more pavilions, experiences and renew the entry to the park. MotionPark created a video that was presented to the government of The Hague. During this expansion, Madurodam will build sustainable eco walls in the forests around the park. The front of the park will be enriched with trees and lawns. New pavilions will be provided with an ecological border which will connect to the forest. Their own terrain will transform into a more park-like feel with trees and bushes adorning. To do this Madurodam will work in close co-operation with people in the neighborhood for a suitable development plan for the area. The park will abide by all legal regulations requirements. To conclude Madurodam's big plan aims at creating a beautiful fusion of a green and ecological park. MotionPark made this video in close co-operation with BlueMoonshot. Currently MotionPark is working on a new experience in the Dutch park Madurodam. For this project we made a trip to New York to create brand new footage for the attraction. The concept of the attraction required to create new filmed content in New York from different perspectives. Effects, sound effects and music is being added to enhance the material. In addition to the original filmed content the attraction will contain interactive game engine content which will seamlessly blend in with the filmed footage. The new experience called “Nieuw Amsterdam” is expected to open next week in Madurodam. Currently you are experiencing MotionParks new website. Now you can check out our Showcase, filled with projects. View our Expertise pages, full with information about our services. Stay up to date by following our News-page or learn more about our Team. Stay connected with our social media accounts and if you have any questions or suggestions contact us at the contact page! Recently MotionPark was hired to start video production for a new attraction in Madurodam which is set to open for the 2017 season. This experience will tell the story of an important event in Dutch history. It will contain techniques and special effects that are totally new to Madurodam. MotionPark works on this project in close cooperation with Blue Moonshot.